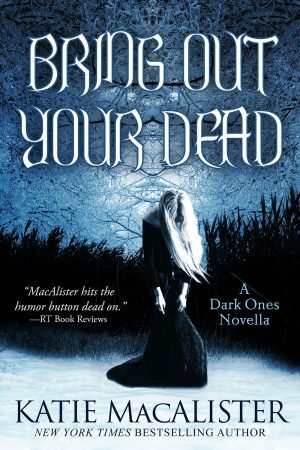 Battling a demon lord is all in a day’s work for the Dark One named Sebastian. But now he must take on a horde of unhappy zombies and an obnoxious teen vampire if he wants to win the hand of the one woman who can make him whole. Ysabelle is a woman with a past, and not a whole lot of future if a certain demon lord has his way. With zombies, demons, and a little thing like death standing in her way, will she find happiness in the man who's seen more darkness than she can imagine? Note: this novella was originally published in the Just One Sip and My Zombie Valentine anthologies in 2006 and 2010, respectively. “Elle est right here avec l’sitting chambre du femmes,” Sally, my other flatmate, called out as she drifted through the room. Sally has issues. “Tabarnak! Vous parlez a mouthful.” Sally beamed at my client as she wafted past him, through the wall, and into the room beyond. “Ahem! Brains!” Tim, new revenant in need of counseling, glared at me. “Qu’est que l’hell?” Sally, who had drifted back into the room on Noelle’s heels, paused to look out the window. “Excellent idea,” I said, relieved that he was channeling his energies into something worthwhile. Most new revenants spent several months at a loss as to how to restart their lives. He nodded and said goodbye. “No, not like that. Intervention in this case means someone has to petition a being with the power to raise the dead. It’s not an easy process. But now, because Salvaticus is traditionally the time of rebirth, the society says we can expect more than three hundred rebirths over the next few days. All the counselors are working around the clock to cope with the influx. Speaking of which, if my clients are playing poker in the hall, I’d best see to them before the neighbors start to complain about naked revenants. Sally?” I poked my head out into the flat’s hall. She turned to face me as Sally showed a middle-aged woman into the sitting room. I told the woman I’d be with her in a minute. “As does anyone with my handicap,” I said, crossing my arms and looking out the window at the rainy London morning. A thin drizzle spotted the window and made the street gleamy damply, casting a gloom over the day that had me shivering slightly. “Ah, but there aren’t that many of you around, are there?” she asked, her head tipped to the side as she continued to study me, evidently cheered out of her own glums by my moodiness. I shifted restlessly, uncomfortable with such close scrutiny.